For many years the Manchester Sheffield & Lincolnshire Railway held the ambition of forging an independent route into London, but was thwarted by strong opposition from its rivals, notably the Great Northern Railway. 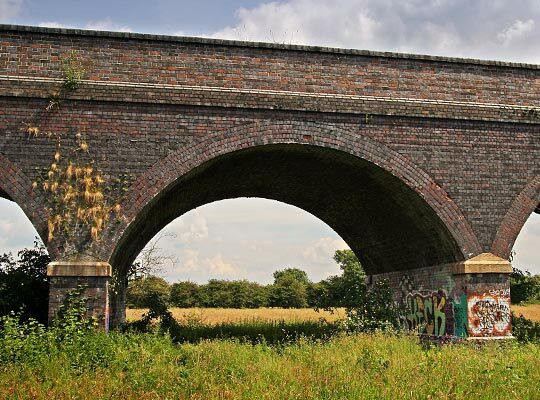 However in 1889 the company obtained permission for a line from Beighton to Annesley where it would form a junction with the GN's Leen Valley route. This opened to traffic in 1892. During the course of this work, engineers Charles Liddell, Edward Richards and Edward Parry prepared Parliamentary plans for an extension to the capital. 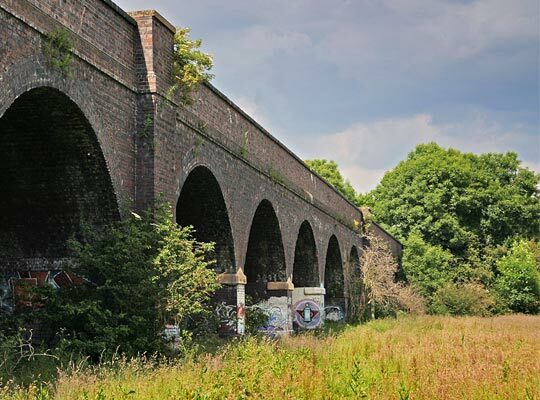 This would run for 92 miles between Annesley and Quainton Road; here it would join the Aylesbury & Buckingham Railway. The initial plans were rejected, but in 1892 an amended scheme was deposited which extended the London portion to a new terminus on the Marylebone Road. After a prolonged struggle, the Bill passed and Royal Assent was granted late in March 1893. Difficulties in raising the capital meant that the seven construction contracts were not let until September 1894. The first sod was cut on the 13th November, from which date the work proceeded smoothly, the line being sufficiently completed by 25th July 1898 to allow coal trains to start running. Formal opening to passengers came on the 9th March 1899. By this time, the company had changed its name to the Great Central Railway. For engineering purposes, the line was divided in two, with Edward Parry being appointed engineer for the Northern Division. Included within this were five tunnels - with a combined length of 2,430 yards - and 11 viaducts, totalling about 3,400 yards. 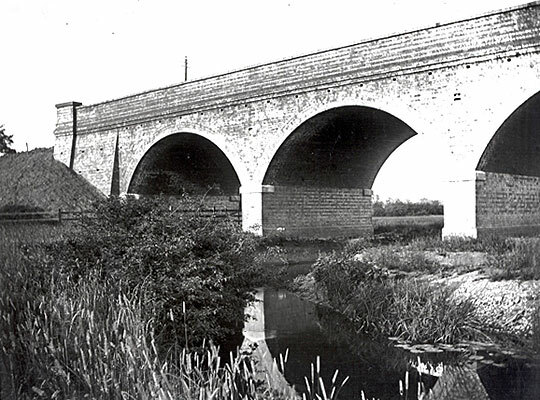 Of the 224 bridges, 155 had steel superstructures; however brick arches were adopted in preference to girders wherever possible. 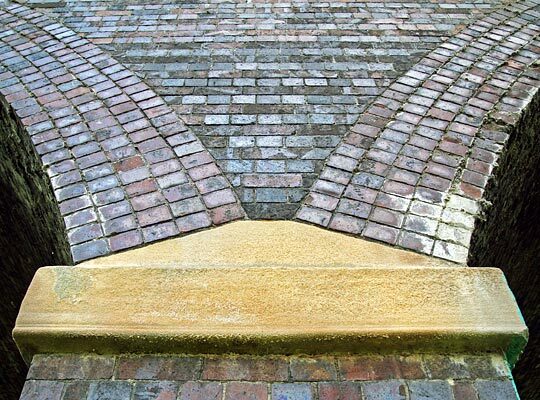 The brickwork throughout was built with common brick in Old English bond, faced in Staffordshire blue brindles. In all but a couple of cases, the arches were built in lias lime mortar. Girder beds, arch springers, newel and pilaster caps were fashioned from Derbyshire gritstone. 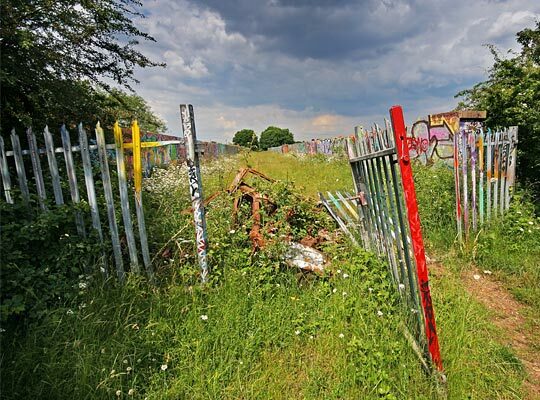 Construction contract No.3 had the least value of the seven at £281,589. It covered the 15 miles 69 chains between Aylestone - south of Leicester - and Rugby. Successful with its tender was a London-based company, Messrs Topham, Jones & Railton. 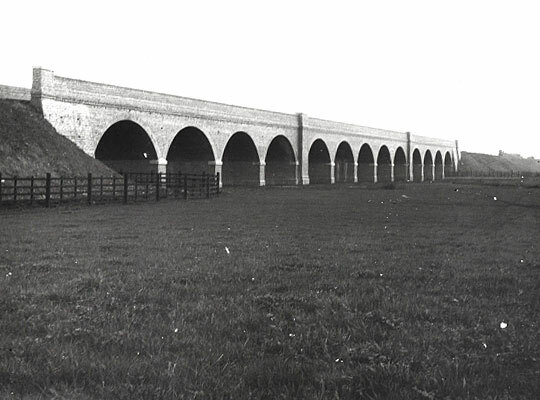 One of the principal engineering works was a viaduct at Whetstone, bridge No.395. 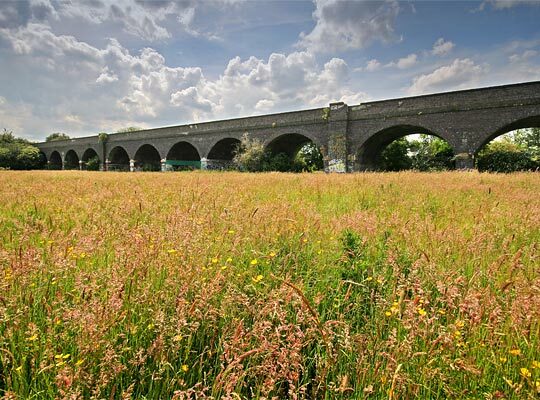 It extends for 151 yards and boasts 13 segmental arches, each 30 feet in span. 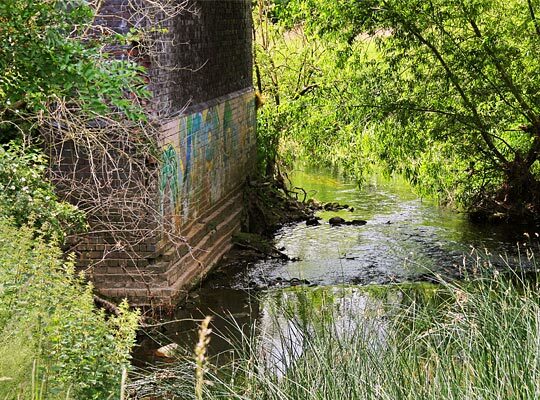 The structure crosses the River Sence and its flood plain, falling to the north on a gradient of 1:458. It was effectively constructed in three parts, with the middle one comprising five spans. This is separated from the four-span sections either side by king piers 12 feet wide. These feature pilasters that form refuges at deck level. All intermediate piers have a thickness of 4 feet 1½ inches. Rail level is about 31 feet above the ground and the foundations stand on marl at an average depth of 12 feet below the surface. Post-war austerity brought the beginning of the end for the London Extension due to it being regarded as a duplicate main line. On Sunday 4th September 1966, the last express ran between Marylebone and Nottingham; the local Nottingham-Rugby diesel service was withdrawn on 3rd May 1969. With that, the line closed after just 71 operational years. 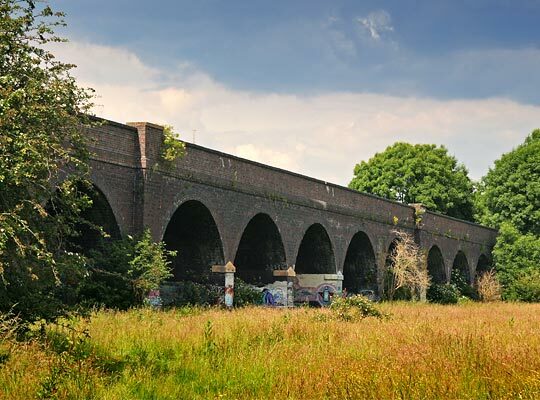 Whetstone Viaduct remains substantially intact, although some damage has been occasioned to the west parapet where brickwork and copings have been toppled into the field. 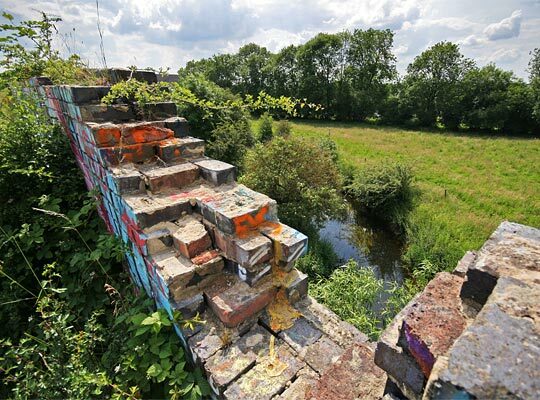 The deck-facing walls are now adorned with grafitti but, despite this, locals continue to use the structure as a walking route. Click here for more material from 'The Last Main Line'.